Abstract: Increasingly, existing evidence indicates that methotrexate-associated liver injury is related to comorbid risk factors such as diabetes, alcoholism, and obesity, rather than to methotrexate itself. Despite this fact, significant effort continues to be expended in the monitoring of low-dose methotrexate in patients with psoriasis. The gold standard investigation has been liver biopsy, but this is associated with significant morbidity and mortality. As methotrexate-induced liver injury is uncommon, the risk/benefit ratio of liver biopsy has been questioned. Fortunately, a number of new technologies have been developed for the diagnosis of chronic liver disease, including transient elastography (TE). 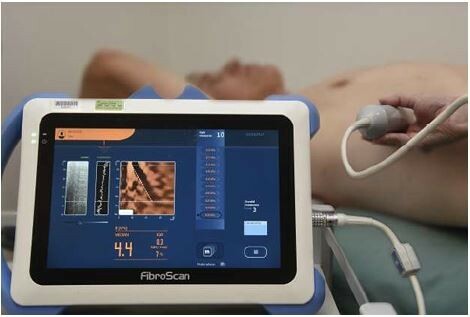 TE is a type of shear wave ultrasound elastography, which measures the speed of shear waves used to estimate hepatic tissue stiffness. Several meta-analyses show very high pooled sensitivity and specificity for the diagnosis of hepatic cirrhosis (87% and 91%, respectively) in a variety of chronic liver disorders. It has a negative predictive value for cirrhosis of >90% and a positive predictive value of 75%. Recent European guidelines now advocate the use of TE as the first-line test for the assessment of fibrosis in alcohol- or hepatitis-related liver disease, including nonalcoholic fatty liver disease (NAFLD). As the prevalence of obesity and metabolic syndrome, including NAFLD, is significantly elevated in patients with psoriasis, TE may be worth considering as a routine investigation for any patient with psoriasis. Although high-quality studies comparing TE with standard liver biopsy in the monitoring of psoriatics on low-dose methotrexate are lacking, the evidence from multiple small cohort studies and case series demonstrates its effectiveness. A recent Australasian position statement recommends that TE should be considered as a routine investigation for monitoring methotrexate therapy, repeated every 3 years if kPa <7.5 and yearly if kPa >7.5. Liver biopsy should be considered for patients with a kPa >9.5.